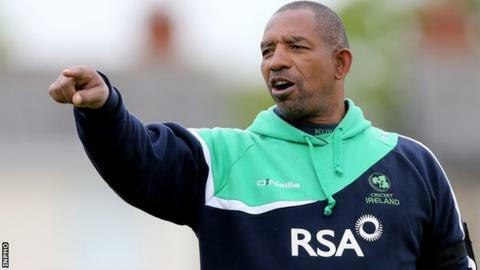 Ireland coach Phil Simmons has left the tour of Australia and New Zealand to return to his native Trinidad to be with his ill mother. Simmons travelled to the Caribbean a day before Ireland complete their World Cup warm-up tour against Otago. Ireland assistant coach Peter Johnson will take charge for Thursday's game at the Bert Sutcliffe Oval in Lincoln. The Irish have lost two of their three matches in New Zealand with the other game abandoned because of rain. Canterbury defeated the tourists by 117 runs at the same venue on Tuesday. The tour began in Australia with two opening defeats following by two victories over ACT Comets. Ireland captain William Porterfield returned home last week because of personal reasons after all-rounder Andrew White pulled out of the tour with a fractured finger. Middlesex duo Paul Stirling (back) and Tim Murtagh (knee) were ruled out of the tour on the eve of the opening game against Queensland last month.